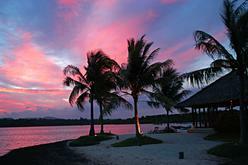 Situated on the northwestern coast of Bali at the foot of Mount Agung, lies the Mimpi Resort. Each air-conditioned room has a private outdoor shower, half covered with thatch and surrounded by leafy plants. The resort, built in attractive Balinese style, is set in attractive tropical gardens and has a swimming pool right on the edge of Mimpi Lagoon. Semi-detached Patio Rooms have cool marble floors, high wooden ceilings, private terraces and a natural (communal) hot spring pool in the garden in front of the rooms. Courtyard Villas are more spacious and have very pleasant bathrooms with wooden sink tables and open showers walled by natural stone which open on to a private garden. Each villa’s courtyard is walled with its own garden and traditional bale bengong, a natural stone tub for private hot spring bathing. Six Courtyard Villas also have a private plunge pool. 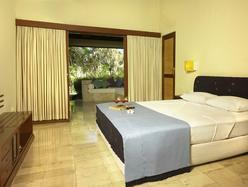 All rooms have an open-air day bed. The hotel has a small spa centre offering a range of treatments from hour-long traditional Balinese massages to two-hour-long exfoliating body scrubs. 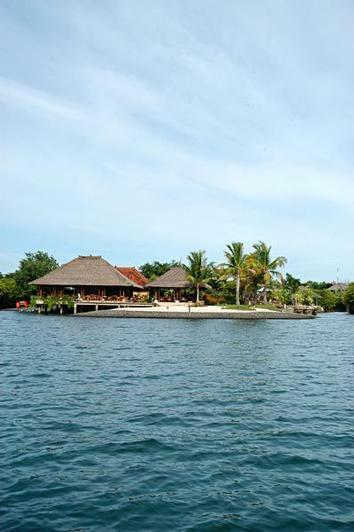 The restaurant is built over Mimpi Lagoon and looks out over the volcanic Balinese landscape. Enjoying one’s morning coffee looking out on to the sea and the mangroves is particularly pleasant! The bar offers quite a remarkable selection of cocktails, many using the local liquor Arak. The Menjangan Wakeup concoction is particularly pleasant! 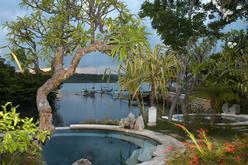 Mimpi Resort has its own dive centre and several traditional wooden boats. Usually two morning dives are taken with a lunch on Menjangan Island. A lunch menu will be provided for you to make your selections on a daily basis. Entry into the water is by backwards roll and there are ladders provided for exiting the water. There is some shelter on the boat and towels and drinks are provided.